I was first diagnosed with HIV when I was 22. I had successfully completed an apprenticeship at a private company in Mexico and was about to be hired when I was told that I was not “medically suitable” for the job. I remember asking myself: “Does this mean that I cannot be efficient at what I am doing because I am living with HIV?” According to the ILO, young people are almost three times more likely than adults to be unemployed. I was young and living with HIV and felt like I’d never find a job. I am now 29 and work for Mexico’s National Institute of Public Health and in HIV and AIDS related civil society organizations. Over the years, I’ve met scores of young people living with HIV. Many have lost their jobs or been denied job opportunities simply because they are living with HIV. Some have no access to social security because of lack of any formal employment. As we mark Zero Discrimination Day on March 1, there are five things about people living with HIV that everyone should know. 1)Treatment allows us to stay healthy and work. There is no cure for HIV but by taking my antiretroviral treatment every day, I have stopped the progression of HIV in my body and nearly brought it to a halt. I’m no exception. An increasing number of people living with HIV can remain well and productive for a very long time. I know some people who have been on treatment for more than 15 years! So it is crucial that the global AIDS response and governments reinforce the engagement on universal access for treatment and health care services for young people living with HIV. 2)Working helps us stay healthy. “Employment is not only a right – it is part of the treatment” says Director-General Guy Ryder. As ILO Director-General Guy Ryder has said: “Employment is not only a right – it is part of the treatment.” Working gives me the financial resources to stay on my treatment and lead a healthy lifestyle. It also boosts my confidence and keeps me on an even keel. 3) Around half of all people living with HIV don’t know it. Our challenge is to make them aware so they can start treatment and live longer and more productive lives. The workplace is an effective place to get that message across. Workers should be encouraged to be tested for HIV while making it clear that the results remain confidential. We need to create environments conducive to voluntary and confidential HIV testing by working together to make workplaces free of stigma and discrimination. 4) People are frequently denied jobs because they are HIV+. I can’t transmit HIV by talking or sitting next to someone. Moreover, HIV does not determine my ability to perform a job. So why shouldn’t I be allowed to work with them? We can all help eliminate stigma by talking openly about HIV and speaking out against discrimination. 5)Filing a discrimination claim is often very difficult. Because I was uninformed and lacked financial resources, I did not take action when my employer discovered my HIV status and left me without a job. It is good to have a national and international platform of policies and legislation but we need to make sure that they are applied in practice. It’s everyone’s job to defend the principles of the ILO Recommendation on HIV and AIDS (No 200). We need to make sure implementation mechanisms are in place and put more emphasis on providing legal services for people with HIV. If everybody knew these five facts about HIV and work, more young people living with HIV could aspire to a better future. As we mark Zero Discrimination Day, let’s remember the words of Aung San Suu Kyi: “Everyone has the right to live a dignified, healthy and productive life. People living with HIV must be allowed to work without any fear of discrimination”. HIV-related stigma and discrimination undermine the ability of PLHIV to secure and retain employment, and block opportunities for training and career progression. For more information see the Stigma Index Evidence Brief on Stigma and Discrimination at Work. 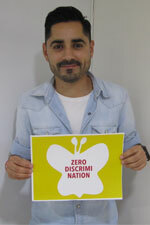 This entry was posted in ILO posts and tagged Aids, HIV, Zero Discrimination by ILO Blog. Bookmark the permalink.